A merits-based (also known as a “fail-safe”) class is like Schrödinger’s cat: until the verdict, there is no way of telling whether the class has 1,000 members or none at all. Indeed, class-action litigation can sometimes seem almost fractal in nature. From the 30,000-foot view the plaintiff advocates, all issues look common: contracts are uniform, misrepresentations are substantially similar, and reasons for not hiring are all part of a larger pattern or practice. But from the close-up view the defendant advocates, every class member is unique, and common proof could never resolve everyone’s claims. One could say that the outcome of the class certification debate turns on whether the court decides that the lawsuit is best viewed through a telescope or a microscope. Most adults who pay with a credit card, use a cell phone, or drive a car have seen at least one class notice in their lives. Class notices have a reputation for being long and opaque, reading much like the credit cards agreements, cell phone calling plans, or warranties that the plaintiff complained about in the first place. Some of this complexity is unavoidable: It is extremely difficult to balance accuracy and clarity, and the presence of lawyers likely tips the scale in the wrong direction. . . . 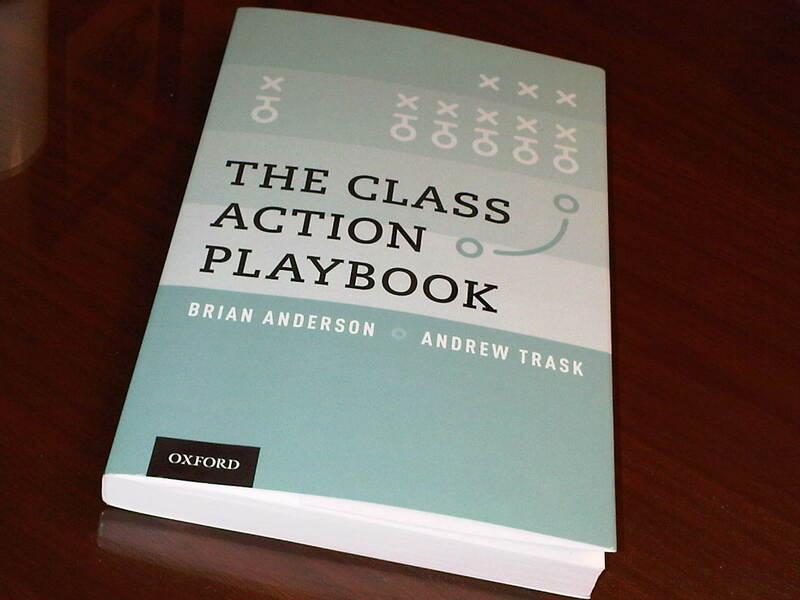 I highly recommend the Class Action Playbook to fellow practitioners and their clients as well as students, judges, and academics alike. Very well done, gentlemen. The latest issue of the Federalist Society’s Class Action Watch is now up and available on the organization’s website. Thanks to Randy Maniloff of White and Williams LLP, for the tip. A synopsis of Maniloff’s own contribution to the issue, from the author himself, appears below. Other interesting topics covered in the issue include trends in mortgage-backed securities litigation, application of CAFA to attorney general actions, “concealed defect” class actions, an analysis of the future of RICO class actions, an analysis of the Third Circuit’s standard of review analysis in In re Hydrogen Peroxide Antitrust Litigation, and a review of the Second Circuit’s recent decision in Morrison on “foreign cubed” securities class actions. Below is a link to “Fifth Circuit Expands False Claims Act Qui Tam Provisions in Time for Debate over Stimulus Package Fraud,” an article that I published in the May issue of The Federalist Society’s Class Action Watch. On February 17, the Fifth Circuit addressed a qui tam suit in the context of Hurricane Katrina insurance issues and made it easier for such suits to be filed. The court observed that the potential for fraud exists in any government program, especially where mass amounts of federal funds are expended in emergency and less-controlled conditions. Coincidentally, eerily so, also on February 17, President Obama signed into law The Stimulus Package. There may be no greater example than the Stimulus Package of mass amounts of federal funds being expended in emergency and less-controlled conditions. The attached article examines the Stimulus Package, and the Fifth Circuit’s recent expansion of the ability of plaintiffs to file a qui tam suit, and concludes that the ingredients are in place for fraud in the implementation of Stimulus Package programs, followed by qui tam suits under the False Claims Act to address such fraud.